Compiled by: Julius A. Eyoh. Series edited by: Roger M. Blench. Engwo is spoken by about 50,000 people in Njikwa Sub Division, Momo Division in the North West Region of Cameroon and belongs to the Grassfields Bantu languages. This provi­sional Engwo-English and English-Engwo Lexicon is compiled primarily for Engwo speakers but it is also of great help to non-speakers who want to learn the language. The lexicon comprises approximately 6.200 entries with (2.902) in the main text and (298) in the appendix. The SIL Comparative Wordlist served as a basis for the initial collection of words. Julius A. Eyoh as a native speaker and linguist basically wrote down the words but did the checking with several native speakers. Each lexical entry includes a phonetic transcription, part of speech and the meaning of the entry in English. Where available, the plural forms of the nouns are given. Some entries have unrelated meanings and so may occur more than once. Noun class numbers are given for the dif­ferent nouns. 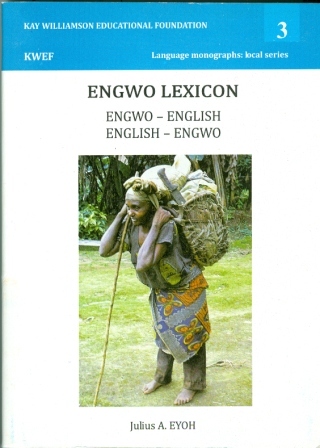 The author’s wish is that this lexicon will arouse interest in the use of the Ngwo language between both adults and children as they learn to read and write the language. The lexicon also serves as a repository of cul­tural terms and information, which may otherwise be lost as the languages evolves.